Meow did not live to see the day where he would be on a normal weight. The cause of death were obesity-related health problems: respiratory and pulmonary failure. 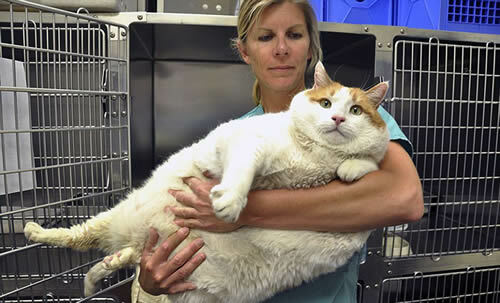 Its a crude reminder that cat obesity is a serious illness and that cats need proper nutrition. Rest in peace Meow. Read the story below, as posted while Meow lived. This is Meow. a 2 year old tabby from Santa Fe, New Mexico. Meow was recently taken in by an animal shelter, as his owner, a elderly woman, was no longer able to take care of Meow. 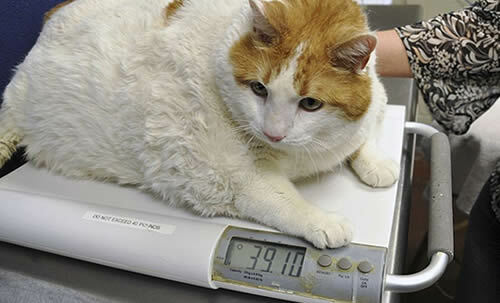 Meow is, aside from weighing almost 40 pounds, a normal cat. Very sweet and a great pet. Meow has trouble walking, caused by the immense weight. Luckily he’s now on a diet and the shelter hopes to have him on a normal weight (around 10 pound) in the coming months. Many times people will laugh at these fat cat, not knowing there is a serious health risk for cat obesity. Meow’s overweight was probably caused by over-sized portions and the wrong type of food. This can be easely prevented with the correct kind of nutrition and portions as well as with enough exercise. The shelter stated it will post updates on their facebook page on Meow’s weight and diet adventure. OMG….. who let that get that and die??? Should be ashamed !! !